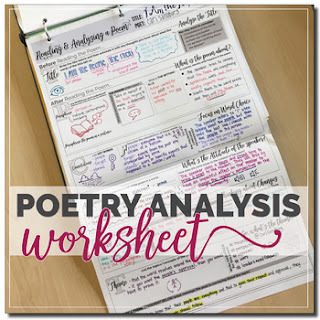 This attractive, and engaging poetry worksheet can help guide students through the process of analyzing a poem, from start to finish. This can help make student learning intentional and meaningful. Please note, that this worksheet comes in two formats: either as a larger tabloid size (11 x 17) - perfect for folding and keeping in binders; or as a double-sided letter size (8.5 x 11). Looking for more poetry resources?